Information : Also called Maizuru castle(舞鶴城), Obi castle was built by Tadatsugu Niiro in 1458. 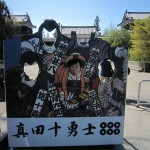 During Sengoku period, to get this castle, there were many battles between Shimazu clan and Itoh clan for 103 years. The castle was demolished by the law after the Meiji restoration. In 1978, but only the main gate (otemon) was restored. Hours : 9:30 a.m.- 4:30 p.m.